How?s your tummy? 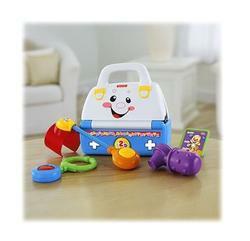 Baby can help, with an adorable med kit full of interactive role play accessories. Press the button on the kit to hear sing-along songs, tunes and learning phrases that introduce letters, greetings and more. Open and close the kit to learn about opposites, too. Includes a med kit with a blood pressure cuff, rattle otoscope, clicker stethoscope and a learning card that introduces body parts. Everything stores inside, making it easy to take on-the-go!